Should You Buy Coach Stock Now? The luxury retailer's business is improving, but investors who buy today could still get burned. Coach (NYSE:TPR) is back in Wall Street's good graces. The stock is up 36% in the last year -- beating rival Michael Kors (NYSE:CPRI) and its 28% spike -- as investors grow optimistic about the luxury retailer's recovering business. Meanwhile, a restructuring initiative has management saying it can achieve a big boost in profitably by the end of next year. These are encouraging signs for a business that's posted declining earnings for the last three straight years. However, investors should keep an eye on a few issues that could push back the business -- and the stock's -- recovery. Coach's annual revenue peaked at $5.1 billion in fiscal 2013 and declined in each of the following two years. The good news is that the slump is about to end. Sales are up 5% over the past nine months, and executives project slight overall growth for fiscal 2016. "We are very pleased with our third quarter performance," CEO Victor Luis told investors in April, "highlighted by a return to growth for the Coach brand." COH Revenue (TTM) data by YCharts. Look under the hood, though, and you'll see that the expansion isn't especially robust. Comparable-store sales were flat in the key U.S. market last quarter, and direct sales ticked up by just 1%. It isn't much consolation that peers are struggling, too. Michael Kors expects comps to tick lower over the next year on what executives call a challenging market environment. Coach's management is more optimistic about its prospects (calling for slightly higher comps in the U.S. this quarter), but given the fragile industrywide trends, growth could easily slip back into negative territory and remove a key pillar of the company's recovery strategy. 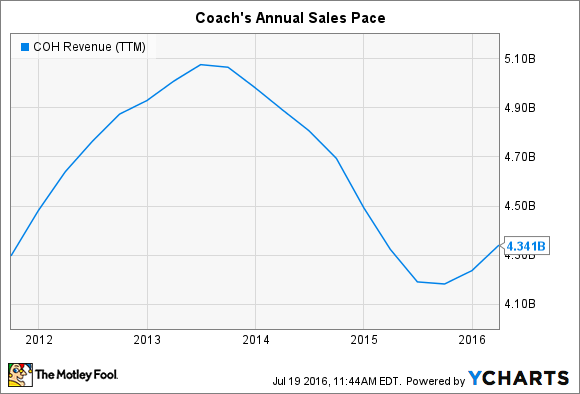 Coach's profit trajectory also seems set to turn around after years of declines. Operating margin has slumped from nearly 40% to the low teens now. While price cuts are still hurting results (gross margin fell to 68% last quarter from 70% a year ago), the pain could be over soon as Luis and his executive team predict an "inflection in our profitability" beginning in fiscal Q4. Consensus estimates are calling for a healthy earnings improvement to $0.40 per share from last year's $0.31 per share mark. It's an open question whether Coach can hit its goal of a 20% operating margin in the next year, though. To get to that point, its cost cuts will have to completely offset the spike in expenses that shareholders have watched over the last few years. Expense growth slightly trailed revenue gains this past quarter, which is a good start. But Coach will have to show a substantial decline in its cost structure for profitability improvements to really take hold. Finally, the stock's recent rally sets shareholders up for a potentially large decline -- especially if the business recovery trails investors' rising expectations. Shares are priced at 31 times trailing earnings, which is a premium that Coach hasn't seen since before the 2008-2009 recession. Even on a forward-looking basis, this stock isn't cheap at 20 times earnings, compared to 11 times for Michael Kors. The fact that Coach has managed to arrest its sales slide without sacrificing profitability is clearly good news for investors. But shareholders who believe in the company's recovery plan shouldn't be surprised if the stock swings lower at times as the retailer works to build a fundamentally more profitable enterprise in the context of weak industry growth.